President Spencer W. Kimball had a great impact on my life. His talks in General Conference caught my attention, as did his personal example. I remember his talk in April 1978 when he told of his experience as a child singing in Primary “Don’t Kill the Little Birds,” and how it constrained this use of his considerable skills with a slingshot while he was growing up on a farm. Don’t shoot the little birds! My first spring in my condominium I was surprised when swallows built a nest in my porch area. Seeing the little eggs, and then the little chicks, was fascinating and fun. Seeing the mess the growing chicks made was not fun, and I made it a matter of policy to stop the annual spring nest-building efforts. I’ve put up obstacles to the nest building, and taken down any beginnings of a nest. I’ve posted in this blog of my past battles with the creatures. Last fall, however, I accompanied a Scout tending to his priesthood duties by collecting fast offerings from ward members. We went to the home of Bob and Karen Martin. 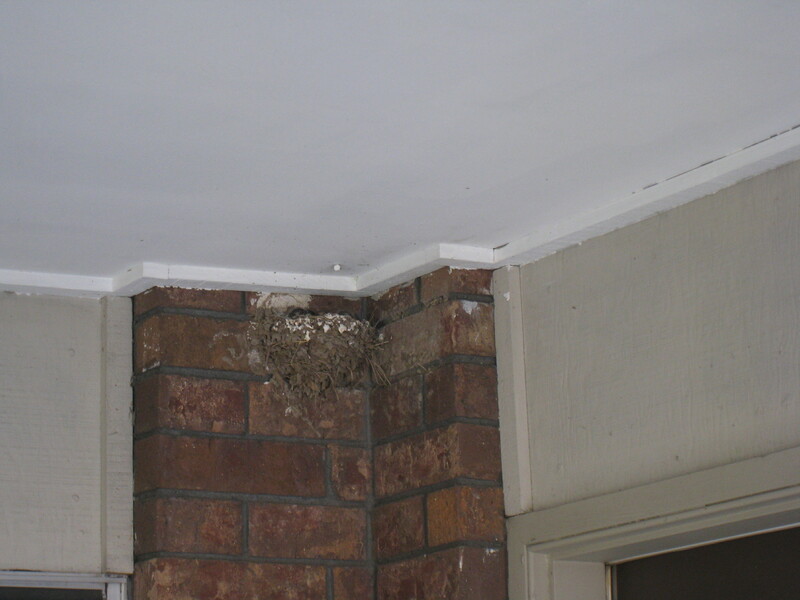 There, just several feet from their front door, swallows had made a nest under their porch roof. The Martin’s told me how much they enjoy the swallows. I asked about the mess they make, and Sister Martin said they simply clean it up. That was a novel idea to me – – just clean up after them! The seeds for a new approach were planted. This spring, when the swallows arrived in the area, they were building nests everywhere but near my home. After all those years, I had in some way, finally, ingrained in them the concept that attempting to build a nest on my porch would not serve them well. I found myself regretting all those years in which I sent the predecessors of these birds packing. Then, one day, they started building a nest near my front door, high up on the wall, close to the underside of the porch cover. I put up no resistance. The nest went up, eggs appeared, and then the chicks. Then came the mess, and I just cleaned it up. Last Friday, August 11, I went with Shawn and Cindy Hoopes to participate in an evening at the Timberline leadership training camp held at the Mountain Dell Scout camp near the town of Mount Pleasant. When I arrived at my home, at about 10:30 pm or so, the swallows’ nest had been knocked to the ground. There was a large pile of broken nest and large feathers that lined the nest. The chicks were gone – – not a trace of them was left. Who killed the little birds? This entry was posted on August 21, 2010 at 9:19 am and is filed under Uncategorized. You can follow any responses to this entry through the RSS 2.0 feed. You can leave a response, or trackback from your own site.